We sailed at the Westfalen Cup over this weekend, with my brothers. 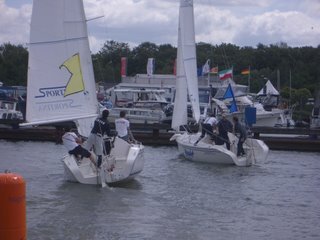 This was a Grade 3 event organized by the Hogel Sport, and was sailed on the Ruhr river close to Dortmund. Although the location was not ideal for sailing, it was a nice spot for match racing with the river offering a great oppurtunitity for the spectatators to be literally in the action. Probably because of this reason, the event was well attended with 5 teams from top 40! This was quite a surprise for us, as we thought that we could use this event for some relaxed training and get some easy points. Training it was, but there was no chance of getting easy points! There were a total of 12 teams, 8 invited and 4 qualified. The lowest ranked team among the invited ones was 165th, the highest 29th. Round robins were sailed in two grops, each 6 teams. Of the 5 mathces we sailed, we won 2 against qualified teams, and lost the other 3 against invited ones. All our losses were pretty close, and were all results of poor pre-starts. The pre-starts were especially difficult at this event, as the space was very thight and the wind quite fluky. One side of the line was sitting in the wind blanket and it was very difficult to enter from this side. In one race, we couldn't reach the line from this side in time, and the blue boat came to us with wind and blocked us from entry. We got a penalty for late entry, but could later give them a penalty from a port/starboard situation. Then, at the last minute we got them in a nice position, where we could lock them underneath us, but I missed the oppurtunity! Too bad that one realizes these situations, afterwards on shore. Finishing the round robin 4th in our group, we could race for the 7/8 position on the last day. Interestingly, our opponent was the best ranked team at the event! Apparently they got their share of bad luck in these though conditions and ended up 4th in their group as well. In the "best of 3" competition, we lost 2-0 against them! Although we were quite confident that we could give them a hard fight, we got two unfortunate penalties in both matches. One for late entry (again a trick of the wind), and once for hitting the sidebars on the river! As I was trying to cushion our hit on the sidebars, the jury thought that I was pushing the boat forward in the light air conditions! A decision, we completely disagreed...but you gotta live with it. Overall, this was a good chance to get some training as we try to build a solid team with my brothers. Next month we'll race in Ancona, ITA at a Grade 4 event, on J24's. Hopefully, we will be able to carry on the momentum and sail more together...(without getting intimitated by our results :). This is adequate training and hope that you gained a lot through the training, this is the way to go in building a strong team. Looking forward to knowing more about you and the equipments you are using.